Transparency Market Research (TMR) in one of its latest business intelligence reports states the global bioremediation technology and services market to be highly fragmented. The market features the presence of several well-established players along with emerging players that are seeking business alliances to strengthen their foothold in this market. Key companies operating in the global market for bioremediation technology and services include Altogen Labs, Drylet LLC, Ivey International Inc., REGENESIS, Sevenson, Soilutions Ltd., Aquatech International LLC, InSitu Remediation Services Limited, PROBIOSPHERE Inc., Sarva Bio Remed LLC, Environmental Services, Sumas Remediation Services Inc., and Xylem Inc.
As the TMR report, the global bioremediation technology and services market pegged a valuation of US$32.2 bn in 2016. Expanding at a steady CAGR of 8.3% between 2017 and 2025, the market is predicted to be worth US$65.7 bn by the end of 2025. In terms of service, among key product segments, wastewater remediation services is likely to witness maximum demand over the report’s forecast period. 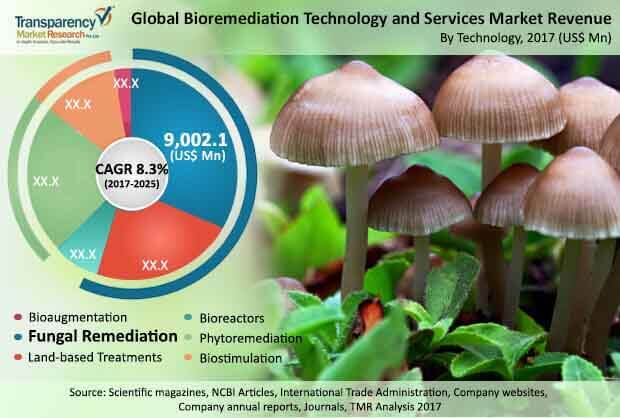 Based on technology, fungal remediation segment is poised to dominate the bioremediation technology & services market as the technology is mostly used by pharmaceutical and heavy metal industries for treating pollution of waterways. By geography, North America holds dominance in the global bioremediation technology & services market due to the presence of several companies that offer bioremediation technologies and services. In addition, funding and support from local governments is also boosting to serve the market in this region. Over the past few decades, the demand for bioremediation has spurred in response to environmental considerations to dispose or decompose waste in an eco-friendly manner. While several synthetic techniques of treating wastewater have come to the fore, organic methods of treating wastewater are increasingly sought. This is stoking demand for bioremediation technology and services. Bioremediation involves the use of biomaterial to counteract or naturally eliminate waste contamination. The process involves breaking down harmful substances into less toxic ones. Also, the process does not use chemicals, which helps to serve environmental purposes as well. Apart from this, rising awareness about bioremediation technology is serving to boost the adoption of bioremediation technology and services. Water shortage threats and government initiatives for environmentally sustainable wastewater treatment practices are acting in favor of this market. Besides this, the bioremediation technology and services market is gaining pace due to the safety bioremediation technologies offer, along with cost-effectiveness and high efficiency. Efficacy of bioremediation technology has been established by various industries and municipal agencies for oilfield remediation, soil remediation, and others. Wastewater remediation accounts for maximum demand for bioremediation technology due to increasing decentralized approach to treat wastewater streams. According to the U.S. Environmental Protection Agency (EPA), in 2016, about US$271 bn were used to maintain and upgrade the wastewater infrastructure. On the flip side, difficulties involved to maintain optimal conditions for bioremediation are slowing its adoption. This could have a significant impact on the market’s growth.